The term ‘big data’ has been thrown around a lot lately – especially as today’s uncertain economy has many companies turning to data to support more informed decision-making. In such a volatile business environment, the imperative for large companies in particular is to leverage big data to streamline processes and improve decision making – the problem for smaller businesses is how to do likewise and in a world of data seemingly intended for bigger corporates and enjoy the same benefit of better access to better and big data. By big data however I am not referring to the sort of data mining undertaken by household brands to predict the sales behavior of their customer. Working in the business to business environment, surveyors and brokers often have a relatively small number of high value customers where the relationship is often complex and quite mature. In our context big data is enhancing the decision making process around the property being bought, remortgaged or improved. In fact we would go as far to say that while big data is the means, the benefit is being able to make better decisions. In surveying, professionals are now referencing flood data, fracking information, subsidence data to name a few data sources to inform and qualify their mortgage valuation reports and underwriting decisions. Big data and the insight it can provide is proving to be a game changer in mortgage and property risk. But while they inevitably look at big data as a means of re-engineering processes, the key is to ensure other parts of the value chain, small and medium-sized businesses are not left at a significant disadvantage. Joining up the dots is paramount if we are to ensure everyone realizes the benefits of a new way of working. At first glance, the tools and personnel that specialize in big data, its uses and implementation can appear expensive. However, despite the ostensible barriers, the technology required to capitalize on the opportunities of data is increasingly available to businesses of all sizes. From instruction to delivered report, data sources are being employed to improve risk management across the piece. 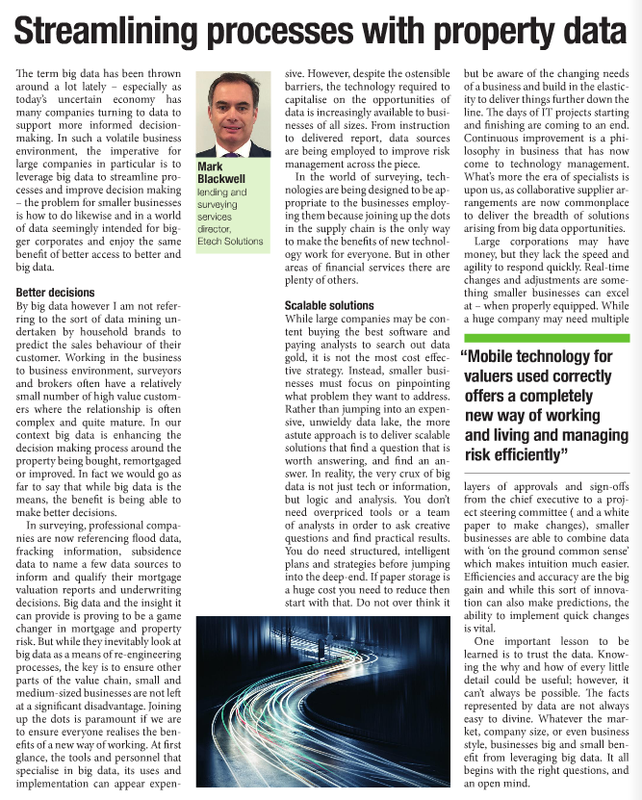 In the world of surveying, technologies are being designed to be appropriate to the businesses employing them because joining up the dots in the supply chain is the only way to make the benefits of new technology work for everyone. But in other areas of Financial Services there are plenty of others. While large companies may be content buying the best software and paying analysts to search out data gold, it is not the most cost effective strategy. Instead, smaller businesses must focus on pinpointing what problem they want to address. Rather than jumping into an expensive, unwieldy data lake, the more astute approach is to deliver scalable solutions that find a question that is worth answering, and find an answer. In reality, the very crux of big data is not just technology or information, but logic and analysis. You don’t need overpriced tools or a team of analysts in order to ask creative questions and find practical results. You do need structured, intelligent plans and strategies before jumping into the deep-end. If paper storage is a huge cost you need to reduce then start with that. Do not over think it but be aware of the changing needs of a business and build in the elasticity to deliver things further down the line. The days of IT projects starting and finishing are coming to an end. Continuous improvement is a philosophy in business that has now come to technology management. What’s more, the era of specialists is upon as, as collaborative supplier arrangements are now commonplace to deliver the breadth of solutions arising from big data opportunities. Large corporations may have money, but they lack the speed and agility to respond quickly. Real-time changes and adjustments are something smaller businesses can excel at—when properly equipped. While a huge company may need multiple layers of approvals and sign-offs from the CEO to a project steering committee,( and a white paper to make changes), smaller businesses are able to combine data with ‘on the ground commonsense’ which makes intuition much easier. Efficiencies and accuracy are the big gain and while this sort of innovation can also make predictions, the ability to implement quick changes is vital. One important lesson to be learned is to trust the data. Knowing the “why,” and “how” of every little detail could be useful; however, it can’t always be possible. The facts represented by data are not always easy to divine. Whatever the market, company size, or even business style, businesses big and small benefit from leveraging big data. It all begins with the right questions, and an open mind.